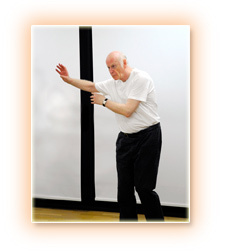 People with Parkinson’s work with professional dancers and musicians to discover and explore the potential and expression in their own movement. There are two dance teachers and live musical accompaniment for the class which lasts 1 hour and 15 minutes. Over a cup of tea after the dance class there is time to chat and catch up on each other’s news at the end of the session. 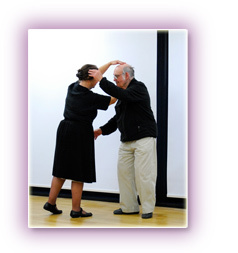 We adapt the traditional structure of a dance class as follows. We begin seated in a circle to warm up the body gently while working on posture, breath and control. We then move on to breath and voice work and exercises and sequences to develop rhythm and coordination. Improvisation and creative exploration of each person’s selected movements is introduced and is supported with musical accompaniment. In this section of the class we do various exercises holding the back of our chair or the ballet barre for support. We modify traditional ballet exercises and work on balance and coordination. We dance with partners or in a group, moving around the studio, performing various taught sequences from previous sections. We present work in a way that ensures every dancer can participate as fully as possible in the class. The class progresses so that new material is taught and explored alongside familiar dance steps and creative and improvisational exercises. Our dancers come to class to enjoy being together and have fun. Our dancers tell us they feel more positive and confident in their movement after dance classes. They report being highly motivated to attend, enjoying moving together with their friends, carers or partners. Everybody has a favourite section of the class. It might be dancing to a well-known tune, repeating familiar dance combinations or exploring their creativity in improvisation and creative tasks. At each session participants work at their own level.